Smartphones are certainly more capable than desktop computers when it comes to photos. There is a built in camera and apps for sharing via email or “in the cloud”. Enhancing and editing can be done right in the phone. The whole thing fits into a pocket and is unobtrusive in use. Here are some thoughts on using a Windows Phone, in my case a Nokia Lumia 900. Most built-in smartphone cameras are quite powerful and comparable in features and performance to many point-and-shoot digital cameras. Once you have taken a photo, you have a number of options for managing and sharing the picture. In the case of the Windows Phone, the camera stores the photos in a folder in the phone called camera roll. 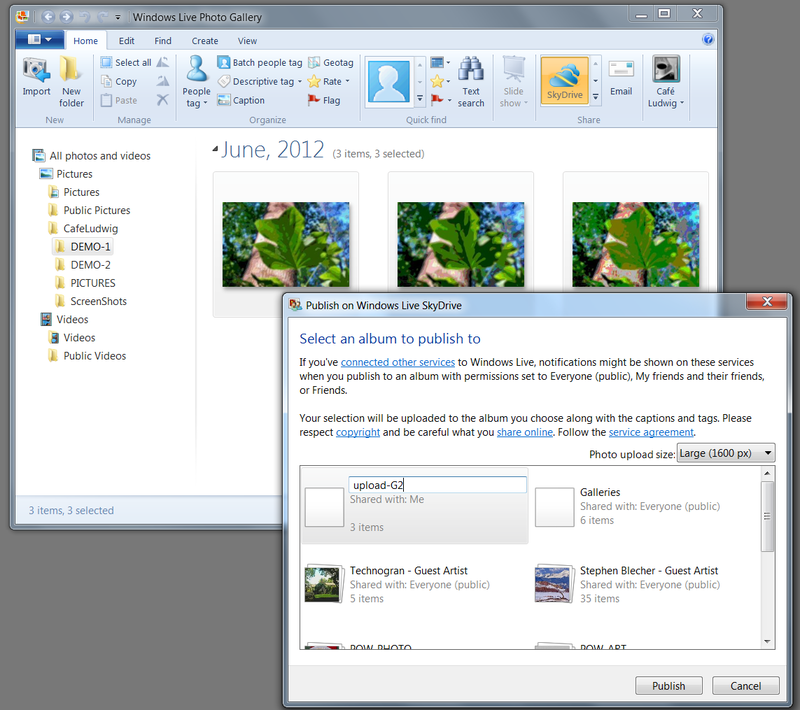 A tile on the phone, Pictures, gets you to the photos stored on the phone as well as to the pictures on your SkyDrive. The SkyDrive pictures can be found under albums. You can keep and enjoy your photos on your phone, of course, but you may want to share them or move them to your computer and manage and enhance them there. As with all things electronic these days, there are several ways to accomplish any task. Moving, copying, or sharing Windows Phone photos is no exception. 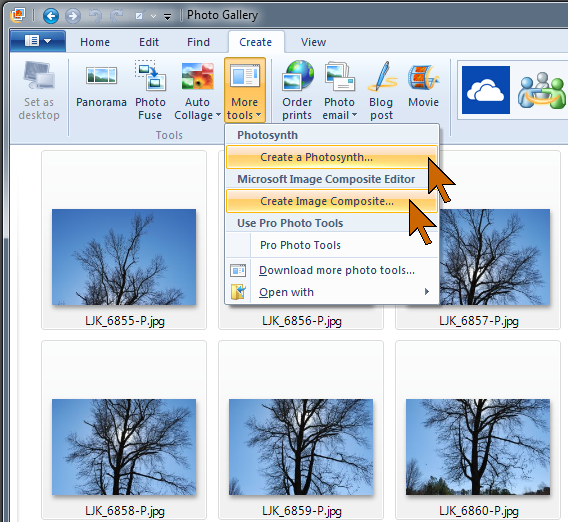 The option to share on SkyDrive can even be set up to work automatically for every photo. The image is copied to a SkyDrive folder named Mobile uploads. If you don’t have a folder by that name, it will be created. 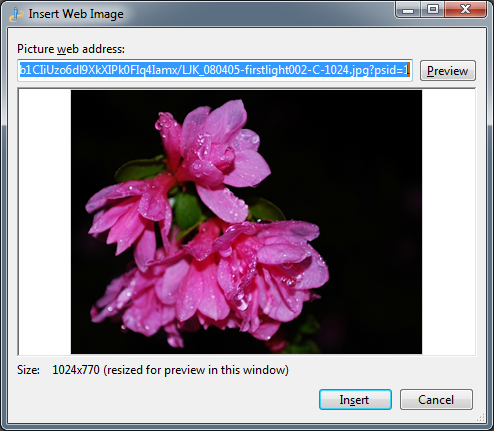 Pictures copied to SkyDrive with this command are scaled to 718 by 518 pixels. 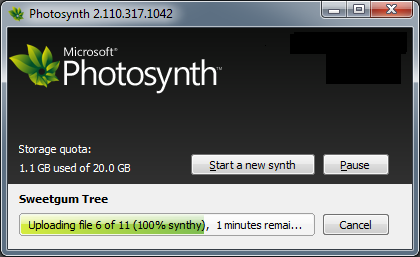 That is less than 0.4 Mpx, less than 5% of the 8 Mpx my camera records. Bummer? Not really. 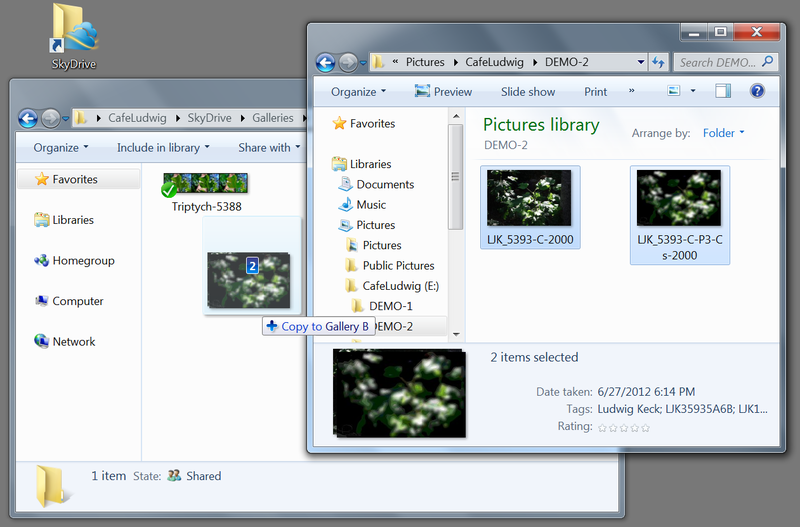 There is a reason for the reduced resolution photos being uploaded to SkyDrive. If you are not in Wi-Fi range the upload goes over the cell phone network. This tends to be costly and slow. It does get it up there right away, so if your Mobile uploads folder is shared with friends, they can see your photos right away. Note: By default the Mobile uploads folder is not shared, so if you want your friends to see that album, you must share it with them first. Attaching photos to emails is the way photos have been shared by all of us for a long time. This is also pretty straightforward with the Windows Phone. Here again the pictures are scaled to a lower resolution. This has been the custom for email sharing for a long time. My Windows Phone reduces the images to 1632 by 1224 pixels, that is about 2 Mpx, about a quarter of what my camera produces. Not bad, but still not the full glory of my Nokia phone camera images. 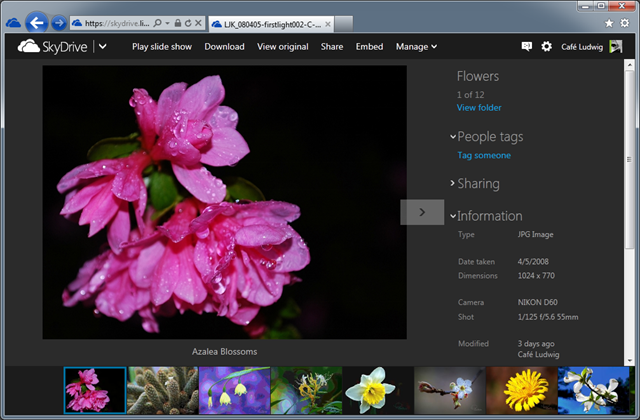 If you want to copy your photos in their full, original resolution, the SkyDrive app (a free download) is the way to go. Without the SkyDrive app you can see your SkyDrive albums on your Windows Phone, but with the app you have full control, just like you have from your computer. 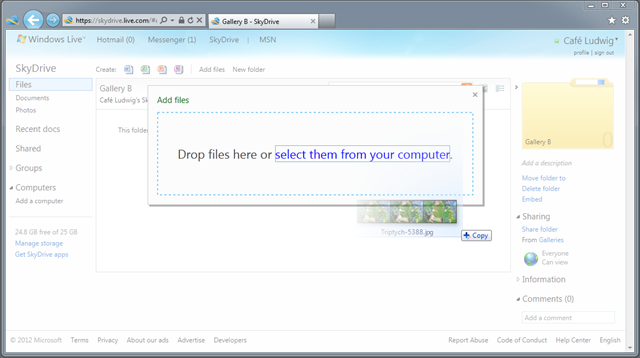 Touch SkyDrive and touch an album, or a folder, and it opens and shows the contents. The circled-plus symbol opens the “add file” window and you can select a photo from any phone folder or even another SkyDrive folder. 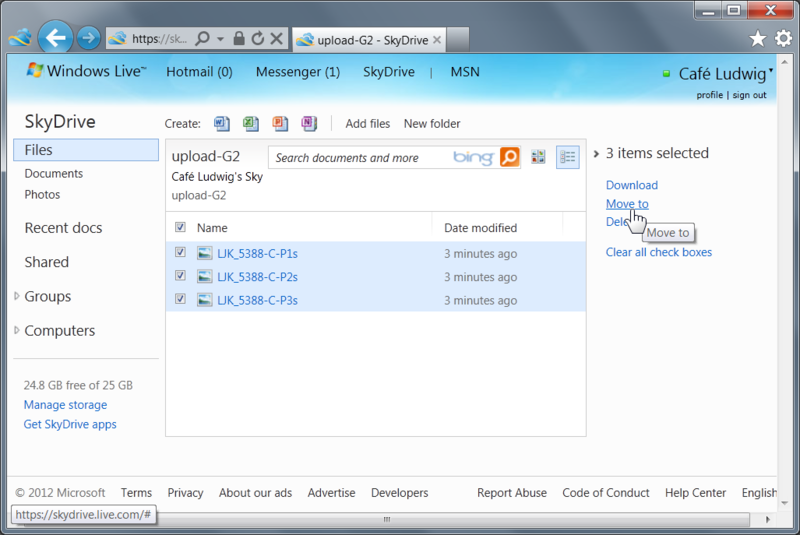 The actual upload to your SkyDrive will take place when you are connecting with Wi-Fi. If you are not connected, the upload will be delayed. This saves you cellphone network usage, at the price of possibly having to wait until you have connection with a hotspot. 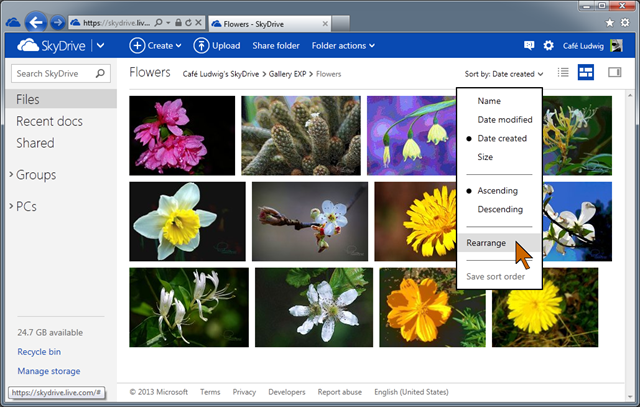 You can select only one photo at a time, and the maximum number of photos set to upload to SkyDrive is five at any one time. As soon as one or more is uploaded you add another. In none of these procedures do you have the opportunity to specify a file name. It is all done for you. The SkyDrive app assigns file names in this format: WP_yyyymmdd n, the “WP_” part is always the same, the “yyyy” is the current year, the “mm” the month and “dd” the day. There is a space which is followed by a sequential number (shown in the format here by the “n”) if more than one image is uploaded in a day. This is the upload date, not the date the photo was taken. If the images are removed from the folder the phone just starts over with the numbers at the next upload. This can cause duplicate file names. Also, if you upload to more than one folder, this numbering can lead to duplicated file names. Be very careful so that you don’t loose images because of file name duplication! You can, of course, connect you phone directly to you computer. Windows Phone requires the Zune program to be installed to handle the communication with the phone. The sync option creates a folder called “From phone name” in your My Pictures folder. 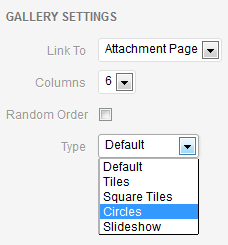 This is the default location, the folder name will contain the phone name that you have set up after the “From ”. Zune creates subfolders in this folder for each folder on your phone. These are named the same as on the phone, so there will be a folder named Camera roll and all the photos in the camera roll folder on the phone will be copied to this folder. The images in the Camera roll folder will be full resolution copies. The naming convention here is WP_00nnnn.jpg with a six-digit, zero-padded sequential number starting with 000000. While this file naming scheme is the same as photos uploaded to SkyDrive with the Share on SkyDrive option, the file names are not the same in the two locations! A specific photo will most likely have two different names! This can be more than confusing. 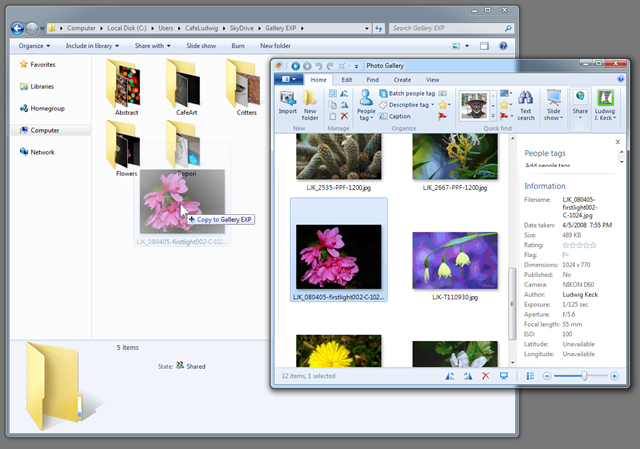 My advice is to move your photos to conventional folders and rename the images in a more consistent manner. 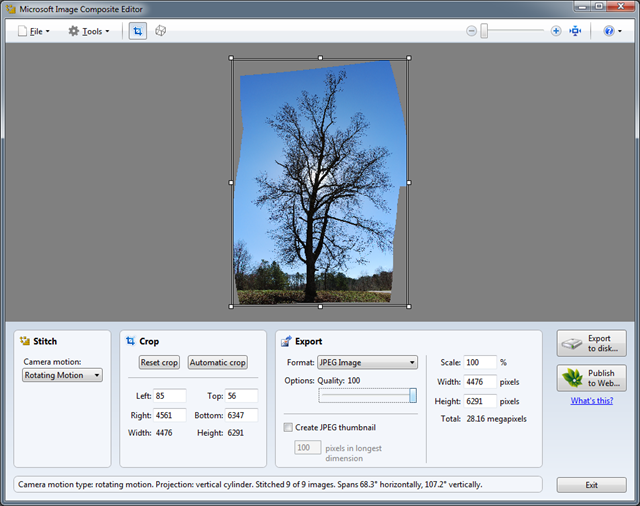 Once you have your cell phone photos on your computer you can manage them just like other photos. In the days of yore, the term “Simulcast” was used to indicate that a program was being broadcast simultaneously on different media like a television channel and a radio station. Here I just want to indicate that this article is posted on two blogs, This ‘n That and Café Ludwig. This “multipost” is part of an experiment which I will report on upon completion.